This exhibition features 20 Surrealist-inspired linocut prints by Slovak artist Vincent Hložník (1919-1997) created in Czechoslovakia in 1962. 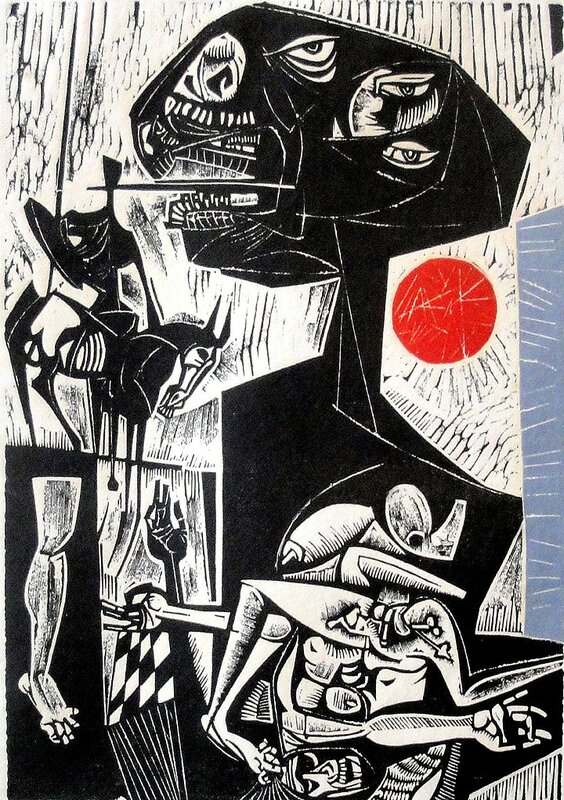 Derfner Judaica Museum + The Art Collection at Hebrew Home at Riverdale is pleased to announce its latest exhibition Vincent Hložník: Between War and Dream, which features 20 Surrealist-inspired linocut prints by Slovak artist Vincent Hložník (1919-1997) created in Czechoslovakia in 1962. They represent a turning point in the artist’s career as his figurative motifs—always related to the exploration of the human condition—began to take on more symbolic and metaphorical meanings. This is the first known exhibition of Hložník’s work in the United States. His work has been widely exhibited and collected throughout the Slovak Republic and was shown during his lifetime in solo exhibitions in Cuba, Egypt, Germany, Hungary, Mexico, Switzerland and the U.K., among other countries. At the 1958 Venice Biennale, Hložník was one of three artists—the other two were Antonio Tapies of Spain and Kenneth Armitage of the U.K—to receive an award from the David E. Bright Foundation of Los Angeles. It was the first time in the history of the Biennale that an American organization had presented an award for which artists of any country could be eligible. As a member of the American Alliance of Museums, Hebrew Home at Riverdale is committed to publicly exhibiting its art collection throughout its 32-acre campus including the Derfner Judaica Museum and a sculpture garden overlooking the Hudson River and Palisades. The Derfner Judaica Museum + The Art Collection provide educational and cultural programming for residents of the Hebrew Home, their families and the general public from throughout New York City, its surrounding suburbs and visitors from elsewhere. The Home is a nonprofit, non-sectarian geriatric organization serving more than 11,000 elderly persons in greater New York through its resources and community service programs.